Megalithic construction of Sacsayhuaman near Cuzco, Peru. These are not surface cuts on a stone mountain. They are individual boulders, many different origin, and weighing up to 300 tons, (one hundred times as heavy as the surface blocks at the Great Pyramid in Egypt), yet fitted precisely together. How was this accomplished? 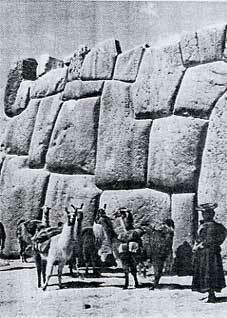 The Pre-Inca builders of the great walls remain unknown.